In a ruling completely separate from TWU’s ongoing healthcare prefunding case, a bankruptcy court ruled today in favor of TWU and two other unions in a case against American Airlines. The unions took the company to court last year to oppose the way the airline was dividing up additional shares of its stock while bankruptcy claims were still being resolved. TWU and the other unions argued that the company’s plan for distribution favored the old equity shareholders of AA at the expense of the unions, thus reducing each union's share of new AA equity below the agreed upon percentage that American Airlines had agreed to allot to them. Today’s court's order will entitle each union to continue to receive the agreed-upon percentage of equity in the new American Airlines. Because the total number of shares that will finally be distributed is not yet determined, TWU does not know yet how many shares this decision will ultimately add to our members’ overall shares of company stock, but it is indeed a victory for all TWU members at American Airlines. The ruling does not have any bearing, however, on the prefunding case. 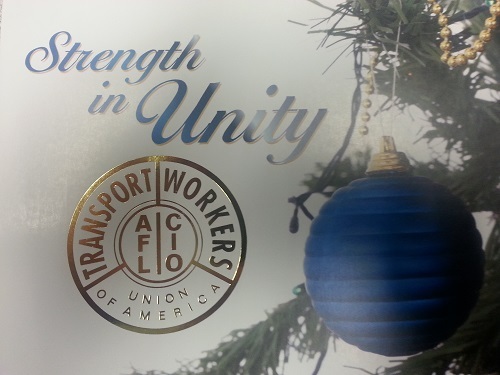 Please see www.TWU.org regarding this posting or any division updates. Vacations – No tentative agreement was reached as the remaining issues include the number of vacation weeks and accrual formula. Hours of Work – No tentative agreement was reached as the remaining issues include the scheduling of part-timers and adverse weather conditions. Video of oral arguments from the retiree equity case at the 9th district federal court of appeals on 12-13-16.